I have found my perfect wedding dress online, but the problem is I am desperate to avoid the pitfalls of buying a cheap online copy and keen to find the real deal. The only trouble is... I have no idea from only a picture who actually designed this dress?!!! I wondered if you might be able to help? It is listed as PS0043, but searching with this code does not show me the original designer or direct me to a reputable site. 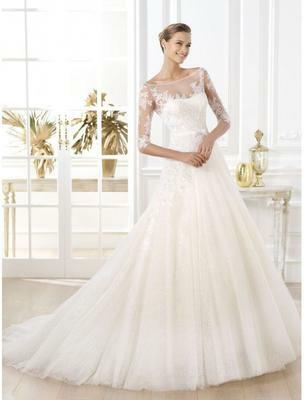 Im not quite sure but that may be a Pronovias 2014 design.